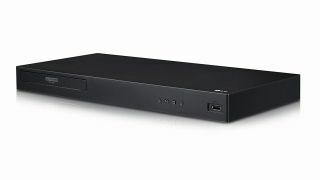 Save up to 50% on budget LG UBK80 4K Blu-ray player | What Hi-Fi? Our Award-winning Sony UBP-X700 is currently on offer for £184 / $159, but if your budget is slightly tighter, fear not, for LG's UBK80 has been discounted to just £119 / $99. We haven't tested this LG 4K player, but if the richly-coloured, finely detailed performance of the company's UP970 model is anything to go by, it should be decent. Amazon customer reviews award it four stars out of five, too. The LG UBK80 does everything it should for its price, with HDR10 support ensuring it'll play any Ultra HD Blu-ray, and 4K upscaling working to enhance your standard Blu-rays. It doesn't play ball with Dolby Vision as some pricier players do, but that's to be expected. It does, however, expand its HDMI and optical connection with a front-panel USB socket for photo, music or video playback from a USB stick or drive. In the UK, the UBK80 has reduced from £179 to just £119 from a number of retailers, including Richer Sounds, Peter Tyson and Amazon. In the US, meanwhile, Amazon is offering the player at just $99, half the price of its original $199 sticker.